One goal of Oregon’s marine reserves is to avoid significant adverse impacts on coastal communities and ocean users. It’s been four years since the first reserves went into effect, and new research is examining the ‘pulse’ of Oregonians’ perceptions of the reserves. This research delves into Oregonians’ awareness, attitudes and perceptions about our state’s marine reserves. Evaluating the human-side of natural resource topics is complex. In fact, this type of research is its own discipline – called human dimensions – which gauges the effects of natural resource issues and policies, such as creating marine reserves, on people. This is done from diverse perspectives using multiple social science disciplines, including economics, sociology, anthropology, political science, and psychology. 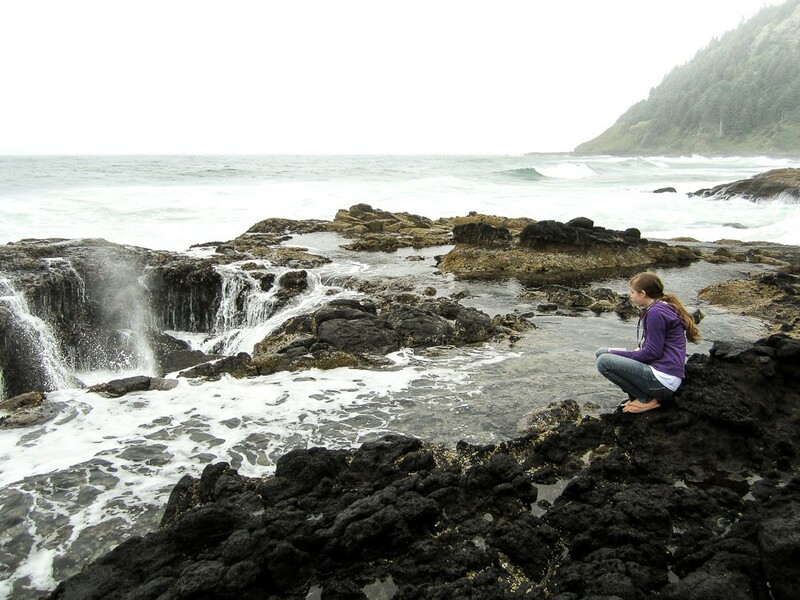 As part of the ODFW Marine Reserves Program’s ongoing human dimensions research a new study, Resident Perceptions of the Oregon Marine Reserves System, was conducted by Oregon State University faculty members Drs. Mark Needham and Lori Cramer, and graduate student Jennifer Johnston. This research is essentially a replication of their earlier work conducted among coastal residents back in 2013. This new work focuses on the most heavily populated region of Oregon, along the I-5 corridor between Portland and Ashland. For reference, the Oregon coast is less heavily populated, with 5% of Oregonians (about 200,000 people) calling this region home. In contrast, the Willamette Valley (I-5 Corridor) is home to 82% of Oregonians (over 3 million people). These data provide an interesting contrast between the coastal areas (studied in 2013) and the population centers (studied in 2016). Three interesting outcomes of this research are reported below. You can also check out the full report here. Support for marine reserves in general tends to be positive and varies depending on where respondents lived. Residents from the population centers (I-5 corridor) tended to have higher support for the reserves in general, relative to coastal residents. “Residents in the population centers were more likely than coastal residents to report positive attitudes for the reserves. For example, 84% of I-5 corridor respondents thought marine reserves are positive, whereas only 64% of coast residents believed that marine reserves are positive,” (Needham, et al., 2016). The study measured factual knowledge about marine reserves to gage what people actually know. Turns out, the overall factual knowledge about the marine reserves is low. But, there were differences among coastal residents and residents of Willamette Valley (I-5 corridor). The coastal residents tended to be more knowledgeable versus I-5 corridor residents. 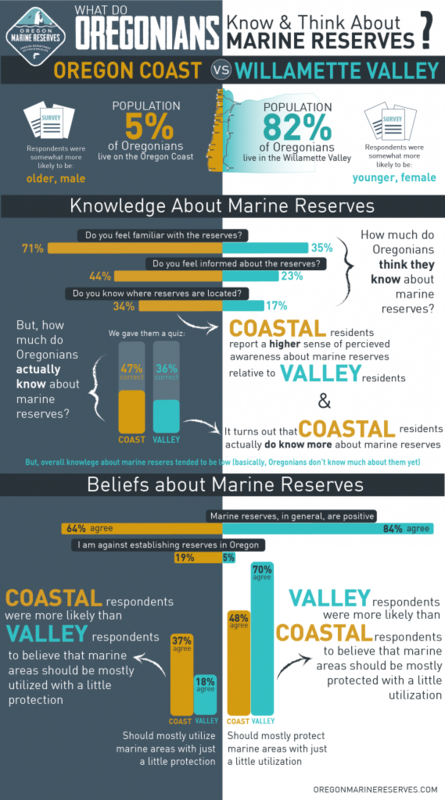 Interestingly, the study also assessed what Oregonians think they know about marine reserves (referred to as perceived knowledge and awareness). Coastal residents reported a higher sense of perceived knowledge than Willamette Valley residents. So, coastal residents think they know more about marine reserves – and as it turns out, they actually do know slightly more. The research suggests that there were four characteristics that could essentially estimate a person’s support for marine reserves. These four characteristics were: how much they report knowing about the reserves, their trust in the Oregon Department of Fish and Wildlife, a positive attitude towards reserves and a strong affinity for the environment. All of these tend to be correlated with strong support for marine reserves. Why Study People’s Reaction to Change?